実谷なな, ヲタみん, レナ, GARNiDELiA, 吉河順央, 霧島若歌, MARiA, ゼブラ, ささかまリス子, 宮崎りゅう，斉藤総助，森永明治 from AIZEN, リツカ, ef. Personally, I don't recognise these singers other than Rena. Why I like this album: The producers of this album have spiced up the original songs by making them more rock-ish and electronic by adding heavier percussions. For several songs they turn it into 'pop' and Jazz style. The heavier beats encourages me to dance when I listen to the songs. The real human voices give me more "feeling" towards the songs I'm very familiar with because the human singers put emotion when they sing the songs, as opposed to just the Vocaloids singing the words. One song I wasn't too impressed with was the cover of Nisoku Hoko (二息歩行). I thought that they set the tempo too fast, and that they over emphasized the back beat of the song,. It was as if they were forcing out the guitar chords, drowning out the vocals. To me Nisoku Hoko is meant to be a relatively sad, but at the same time a happy song. It is a song about growth, love and hurt. The increased tempo made me lose the sad feeling of the song and the singer gave me the feeling of happiness, not the kind of sadness one feels regarding departure. Personally, I like the cover of Nisoku Hoko that Piko (or even Valshe) did instead (Will post another blog about Piko and Valshe soon! :D). The album art depicts two girls sitting on a black and white checkered floor with one side covered in broken clocks and moss and the other side blossomed over with flowers. 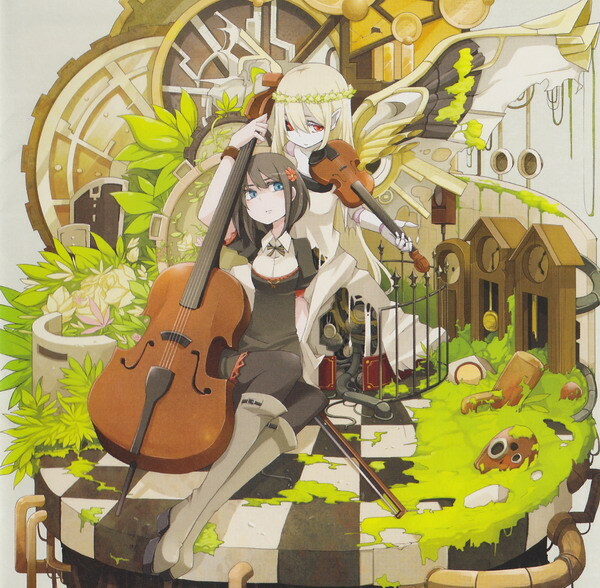 One girl appears to be a fairy with a broken wing and is holding a violin. While the other girl, presumably human, is holding a cello. It seems to me that the artist is saying that music can have both a beautiful side and a not so pure side. It all really depends on the person making the music and on the listener. Overall, I give this album 9 out of 10 . This album is definitely going on my favourites list, and it will be one album I'll play when I have friends over. And so...here goes my life log updated yet again. It's been a few weeks since uni started and I am finding it busier compared to last year. I have to do work experience this semester which is interesting. I have to do minimum 100 hours in the semester. Ganbatte to me! Anyway, uni aside, I have also been preoccupied playing 'Draw Something' with friends. Basically, it is a drawing/guessing game (similar to Pictionary). It is quite fun and addictive, however drawing on a touch screen phone without a stylus is quite hard indeed. My current streak is 'Turn 27' with Rhycen and I aim to push that up ever higher. That aside, I haven't played Project Diva in quite a while, ever since my save file got overwritten, I haven't been bothered restarting again. Maybe later. Oh, and the blog will be getting a renovation soon since I have recruited a couple of my friends to help me post content to keep the blog alive. Rhycen and pumpkin_so77 will be covering 'Games' and 'Vocaloid' respectively. So now, my blog is more of a 'social' community blog that expresses opinions and thoughts of the web, life in general and the world around us. Although I would like to keep it a bit more personal to me, eventually you may get bored about my ramblings. So, to make things interesting, this blog is not single topic oriented rather it is more of a 'social' blog. I plan to include more social media and interactive applications to the blog in the future. Anyway, enjoy your day. Stay safe and be happy!